Home > Post Earrings > Silver Mercury Dime Earrings with Angel Wings. 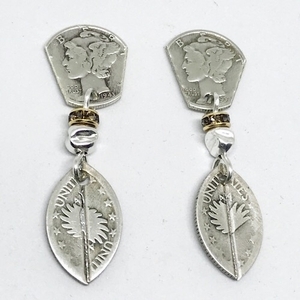 Authentic silver dimes cut and shaped, unique sterling silver beads, Austrian crystal rondells and wings from Standing Liberty quarter that have been soldered together to create angel wings. This unique pair are post and can be ordered in clip ons.